Consists of 2 easy to use detection products, when extra security is important! Printed 1996 and later. 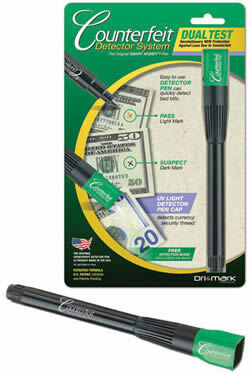 Use the Counterfeit Detector Pen to check for authentic US Currency paper. UV light is also perfect for authentication of credit cards, personal and Traveler�s Checks, passports, driver�s license, IDs, etc. Works on old & new US currency. Detector Pen: Special patented formula detects bad bills. Detector UV Light: Proof positive for new bills. 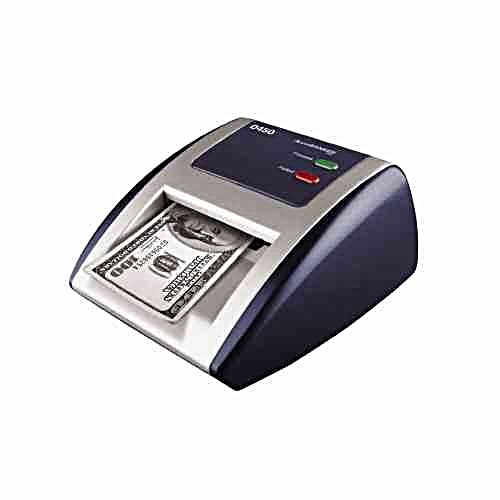 UV Light also validates Foreign Currency, Credit Cards, Passports, IDs, Driver�s License, etc. Protect your hard-earned money from counterfeits anywhere you go. Quick-and-easy turn on/off innovative feature makes this counterfeit detector a very user friendly one. Its powerful UV lamp and incandescent light will reveal UV and watermark security features hidden in bills, checks and other security protected documents. Its lightweight, sturdy and battery-operated design will make it your best detection aid. Self feeding detection system eliminates the need to visually inspect suspect notes. This automatic counterfeit detector checks for ultraviolet markings, magnetic ink, and infrared in less than 1 second per bill. An audible and visual warning notifies you if the bill passed or failed the test. Compact, fast and reliable, the D500 Authenticator verifies immediately the authenticity of US currency and its denomination. Extremely user friendly and accurate. Truly a versatile component to any business. An audible and visual warning alerts you when a suspicious bill is detected. Identify, detect, and count with the latest in multi-currency identification technology. This detector boasts the ability to identify currencies from multiple countries and display their values in multiple languages! The multi-orientation feature makes the D580 a user friendly detector. An extremely easy and efficient machine, the D580 can immediately verify a banknote, its denomination, and its authenticity. Truly a versatile component to any business. The same counterfeit fighting technology used by banks for years is now available for small business. With a total of 12 watts of UV power this money detector is strong enough to work under any condition. Check for counterfeit banknotes using simultaneously ultraviolet and watermark detections systems. Although this portable counterfeit detector is equipped with two 9 Watts UV lights (18w), it is specifically designed to protect the user from direct eye exposure to the UV rays. Clearly visualize the fluorescence of the security thread in U.S. notes or fibers and other features present in other currencies, credit cards, special documents, etc. The enhanced watermark screen allows an easy verification of illustrations. The compact and small design of the detector saves space on your desk or counter. Protect hard earned cash with this quad counterfeit detection system. Check for counterfeit bills using ultraviolet, watermark, magnetic ink, and micro printing detections systems. Additionally this counterfeit detector is equipped with an auto-on/off sensor saving you energy and time. Additionally, the D66 counterfeit detector is equipped with an auto on/off sensor, an enlarged magnifying glass and with the advantage to check for ultraviolet and watermark features simultaneously. This analyzer includes a folding stand for angled viewing to protect from UV ray eye exposure. 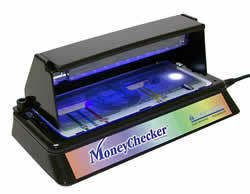 The Counterfeit Money Detector Pen detects authenticity on U.S. currency instantly. The patented formula leaves a temporary LIGHT/AMBER MARK if the bill is GOOD, or a DARK BROWN or BLACK MARK if the bill is SUSPECT. Each pen tests over 10,000 bills. The MoneyChecker is a reliable, economic, quick and accurate anti-counterfeit tool used by banks, financial institutions, retail and restaurant chains nationwide and abroad. The Basic and Industrial models are designed to verify the authenticity of US currency. The Universal model is designed to verify the authenticity of US currency and provides an additional UV lamp that allows authentication of many additional documents such as credit cards, travelers' checks, driver licenses and other ID's. 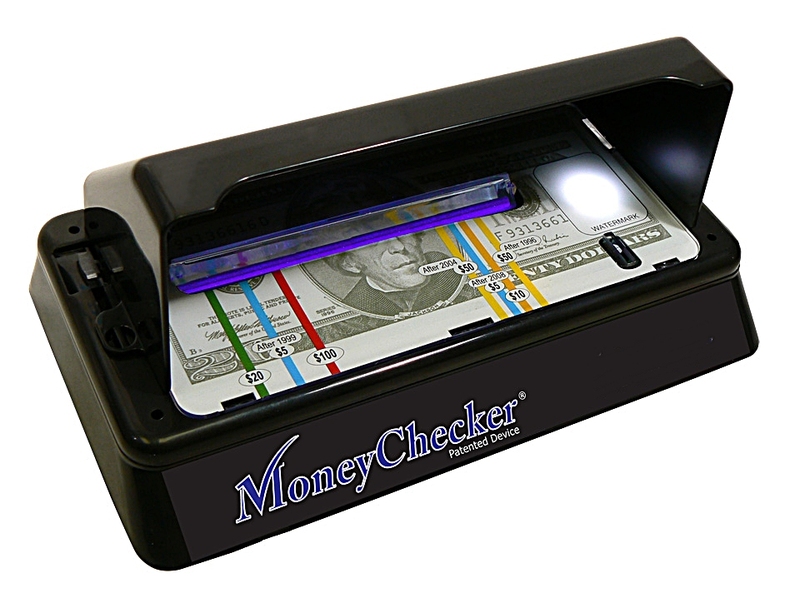 The MoneyChecker identifies two covert security features: the denomination specific color-coded Security Thread with Micro-printing, and the Watermark. The US denominations $5, $10, $20 (including the new $20), $50 and $100 printed after 1996 all contain these security features. The built in template provides the correct location and color of the security thread when activated by ultraviolet light which is unique to each denomination. 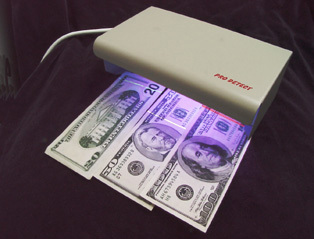 �One long-lasting ultraviolet lamp enables the detection and verification of fluorescent security features found in US currency. �One standard lamp that illuminates the watermark. �A built in reference template. �A sensor that automatically activates the device when a document is inserted. �The unit automatically deactivates after four minutes of non-use. The ProDetect Counterfeit Detector is one of the most effective UV light and detection device available. It's dual light is superior to other UV lights on the market. This greatly increases the illumination to detect the security features when the bill is placed under the light. When staff members are busy, they need a reliable device that provides immediate visible verification in a simple operation. Pro Detect has proven to be an invaluable cost savings tool utilized by Banks, Retail Stores,Restaurants, Casinos, Lottery Ticket outlets, Drivers License branches, etc. The Pro Detect will save you time, but most importantly MONEY.